uTorrent Turbo Booster is a recent plugin designed to improve the functionality of probably the most popular P2P file sharing application around uTorrent. uTorrent Turbo Booster comes equipped with modern technology that aims at getting your download speed way up so you can grab the files you want so badly much quicker than you have been used to. Movies, music, games, applications, you name it, uTorrent Turbo Booster will deliver at a fast pace. ...... uTorrent Turbo Booster will be there doing its job in the background without upsetting any other activity you might perform on your computer. Another benefit you will gain by using this high end module is a higher number of download sources; more seeds will be available to you than normally discovered by your uTorrent. 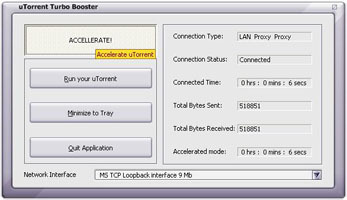 A crucial element in choosing a proper accelerator such as this is reaching a full Internet connection tolerating at the same time minimal requirements well, uTorrent Turbo Booster does them both. Your bandwidth will get its highest capability and you ll get low CPU and a happy face. Qweas is providing links to uTorrent Turbo Booster 4.0.1 as a courtesy, and makes no representations regarding uTorrent Turbo Booster or any other applications or any information related thereto. Any questions, complaints or claims regarding this application uTorrent Turbo Booster 4.0.1 must be directed to the appropriate software vendor. You may click the publisher link of uTorrent Turbo Booster on the top of this page to get more details about the vendor.